Majolica (Maiolica in Italian) is a decorated tin glazed earthenware, low fired and decorated over an opaque tin oxide glaze. The firing temperatures allow for the brilliance of colors. Most of the ceramic villages are located along the riverbanks where there are natural clay deposits and this clay makes the product special and of finer quality then other kinds of ceramics. Poggi Bonsi. LLC imports from small family workshops in Italy located in Deruta, in Umbria and Montelupo, in Tuscany, and Abruzzo. Our French ceramics are made in the villages of Vallauris and Mougins in the south near Cannes. Each Ceramic region has an intrinsic style and history. At www.poggibonsigifts.com we have a large selection of Italian Majolica from which to choose. In the 10th Century the Calif of Persia received a gift of over 2000 pieces of porcelain from the Emperor of China. Persian craftsmen were amazed at the white and blue glazes. Thought they could not unravel the secret of the Chinese glazes they were able to invent their own techniques to duplicate the effect. The potters of Baghdad exported their wares all across Northern Africa and many Islamic potters migrated to Morocco and eventually Moorish Spain, bringing with them the secrets of creating this colorful pottery. After the Moors were thrown out of Spain, Majolica potters set up small factories in Italy near the mineral rich river in the towns such as Deruta, Gubbio, and Faenza where the finest clay deposits and minerals for the glazes were found. In the 16th century luster glazes similar to those used in Valencia and Talavera, Spain were developed in Umbria. Eventually Majolica crafters settled in many other parts of the world where the craft developed into new and distinctive styles. In Holland it became delicate blue and white Delftware, in Germany it became dainty Dresden porcelains. The French name reflected its Italian origin, faience after the city of Faenza, and in the New World it was called Talavera after the potters who immigrated to Puebla, Mexico from Talavera de la Reina, Spain between 1550 and 1570. Most of the pottery known as Tuscan pottery or Florentine pottery is actually made in Montelupo Fiorentino--a beautiful little village of approximately 11,000 which is located about 10 miles from Florence. Montelupo Fiorentino was one of the most important Italian ceramic centers in Italy during the Renaissance and immediately after and has seen a revival of its ceramic industry during the last 10 years. Our Collection of ceramics from this village include Tuscan Vista, and Terra Bianco which are made in a family-run studio in Montelupo Fiorentino. Hundreds of years ago the territory of Montelupo, situated between Montalbano and the middle course of the Arno, was already an important crossroads on the communication route between the Florentine area, the Apennines and the Tyrrhenian coast. Its location on the old Roman road that joined Florence and Pisa and the presence of waterways led to the development of numerous manufacturing activities, including ceramics. Since its Tuscan ceramic heyday during the Renaissance, Montelupo had lost some of its heritage and was considered for a very long time only a minor pottery production centre. The role played by Montelupo pottery in the history of Italian ceramics was re-defined only a few years ago, thanks to the unexpected discovery of an old well full of kiln shards. Hundreds of ceramic pieces from the Renaissance were found in the excavations headed by an association of volunteers. Now they are featured in the Tuscan pottery collection housed in a newly renovated Museum of Ceramics. The village has undergone a transformation recently in the form of a remodeled piazza and main streets. On our first visit to Montelupo Fiorentino in 2002 the main street, Garibaldi Avenue, was an open trench covered with a plywood patchwork of sidewalks and bridges. We had to walk gingerly along the uneven surfaces in our new-purchased Pradas. Today Garibaldi Avenue is an elegant example of the Italian knack of blending ancient architecture with modern style. The street features a clay statue by Sergio Pucci, called "The stranger can only see what he knows." The top of the street is adorned with a stunning fountain, which is in the shape of a boat. The pavement is decorated with a motif representing the waves of the Arno River. These three works are conceptually conveying the idea of travel and migration. Today the village of Montelupo Fiorentino is a little gem boasting charming streets lined with shops featuring Tuscan Majolica pottery, jewelry, linens, Italian gourmet foods, and restaurants serving local specialties. 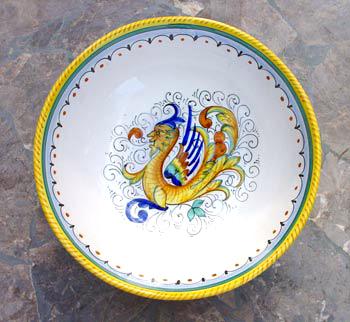 Poggi Bonsi is delighted to include a wide assortment of Tuscan Ceramics in our "Toscana" Collection of Italian ceramic Majolica.